The Twins have used two of their past three first-round draft picks on right fielders, and both now rank among their top five prospects. Jake Cave returns from a tremendous rookie showing. 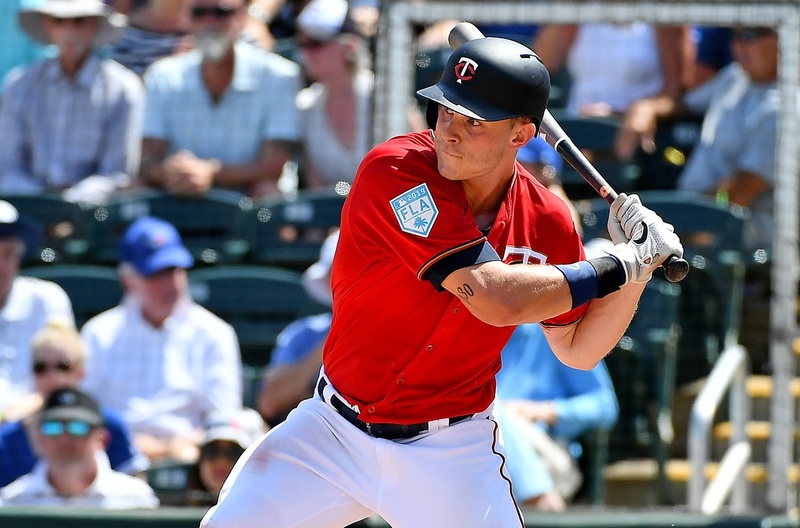 And Max Kepler is now entrenched with a fresh five-year contract extension. Accounting for both current and future outlook, no position is in better shape for the Twins than right field. Let's dive in. Kepler is coming off a breakout season. It didn't show up on the offensive stat sheet but by any defensive measurement, the third-year player took a star turn. SABR's Defensive Index ratings (SDI) pegged him as the American League's third-best fielder in right, behind only Gold Glove winner Mookie Betts and runner-up Aaron Judge. FanGraphs' Ultimate Zone Rating had him second behind Betts. At the Minnesota Twins Diamond Awards, Kepler was recognized as the team's defensive player of the year. Not only was Kepler a standout in right field, but he also looked quite sharp during stints in center. Given Byron Buxton's history of injuries, that's a valuable capability, and one that magnifies the importance of depth behind Kepler in right. On that front, the Twins happen to have another guy who was recognized at the Diamond Awards: Jake Cave, most outstanding rookie. When both were on the field last year, it was usually Cave in center and Kepler in right (Paul Molitor loved his continuity), but I suspect roles we be reversed in the event of Buxton's absence this summer. Cave is better suited for right and his powerful bat certainly played there last year as he slashed .269/.316/.481 with 13 homers and 45 RBIs in 91 games. Not a bad backup plan. But of course, we're all hoping Buxton stays in center and Kepler holds down his post in right field, where he offers an interesting mix of steady baseline production and simmering potential. On the surface, Kepler's 2018 season at the plate looked like more of the same. His .727 OPS was nearly identical to his .732 mark coming in. In 611 plate appearances, he hit 20 home runs and 30 doubles – all in line with his career norms. Yet, a deeper look shows us that Kepler drastically increased his launch angle and, as a result, hit way more fly balls than ever before. This didn't manifest in his production, largely because of a career-low .232 BABIP (it was in fact the third-lowest number among all qualified MLB hitters). Luck-based outcomes rise and fall, but the kinds of swing adjustments leading to increased elevation are bound to pay long-term dividends. So too are Kepler's advancements with plate discipline. Last season saw him post career bests in K% and BB% – both by significant margins. His BB/K ratio ranked among the top 10 in the AL, sandwiched between MVP candidates Andrelton Simmons and Jose Altuve. So what we've got here is a pristine athlete, entering his age-26 season, emerging as an elite defensive outfielder and showing every sign of an impending offensive breakout. That's not just my homerish opinion, it's a conclusion of any objective analysis. Which makes it all the more surprising the Twins were able to strike such a team-friendly extension. The outfielder's camp is surely aware of all these indicators, but his words upon signing the deal appear to ring true: "Honestly, I’m the type that would play for the minimum." His long-term entrenchment could quickly create a logjam, with the organization's #1 prospect and 2018 first-rounder rising fast in right field. But the Twins will happily deal with that "dilemma" once they get there. Through three seasons and 1,600 plate appearances, Kepler has been an astonishingly consistent hitter. Sure, there have been isolated streaks and slumps, just like for any other player. But from year to year, his OPS has always ultimately fallen within seven points of his career .730 benchmark. So while we can look at the underlying indicators of his 2018 season and forecast improvement (every projection system does), we do have to contend with the reality that Kepler hasn't yet demonstrated he can be more than a slightly below-average hitter for his position. Granted, he also hasn't given us reason to expect any less than that, so the downside here is fairly minimal. Packaged up with his top-notch D and outfield versatility, Kepler's unspectacular standard production still makes him a solid regular. I hesitate to use the phrase "embarrassment of riches," but only because it's an overused phrase. It's very accurate here. The Twins are loaded in right field. Their starter is one of the best defenders in the majors, and seemingly verging on an offensive breakthrough at age 26. He's also under ultra-reasonable control through 2023 at least. The backup, Cave, is coming off an excellent rookie year. Kirilloff, Larnach and/or Rooker could legitimately be knocking on the door late this summer. Unless multiple things go awry, the Twins will soon be trying to sort through outstanding bats standing ready at this position. Which brings to mind another overused, yet fitting, adage: Good problem to have. And let’s not forget that if Der Schlagger cracks 23 homers, he’ll become the career leader among those born in Germany. I think the defensive stats should be taken with a grain of salt. They spiked mostly b/c Buxton wasn't in center (same happened for Eddie in LF). If Buxton is playing CF full time next year, Kepler's defensive value will probably revert closer to his 2016-2017 numbers. Let's consider something else about Max Kepler: His sports background. Early training in dance footwork and balance have given Kepler a level of athletic poise that few possess, even at the MLB level. The benefits of that poise are two-fold: It gives him the ability to make improvisational plays, and it helps him avoid "clumsy" accidents that with less gifted athletes often result in injury. Kepler's athletic poise reduces his chances of injury from clumsy footwork. It also reduces his chances of throwing injuries, because his footwork is almost always precise. We can expect Kepler to have a long, healthy career of consistent high quality performance. Even when he's sliding or diving, Kepler is always on balance. jimbo also pointed out in a game thread once that Kepler is a front-of-foot runner — much less susceptible to a running injury that way (though I’m sure there’s research that shows the opposite). Try running barefoot and see what your body tells you. I’m on board. Very athletic guy sitting on a big year, I hope. However, I will miss how Kepler used to do that little dance step when catching easy fly balls. I think they coached that out of him. Jimbo, I hope you didn't hurt your back with that extreme stretch! There's a reason ballet dancers wear slippers. All blame goes to the maker of baseball cleat shoelaces. Thanks again Nick! These are fun and thought-provoking reads. Why put Keirsey in the Depth category? He's more of a deeper prospect at this time. Kepler.Wade.Kiriloff.Larnach.Rooker.With Kepler signed to the extension, where are they going to go with all of these highly thought of prospects?Only one can move to 1B. I think Kepler can play any spot in the OF defensively. Nelson Cruz isn't going to DH forever, and having a player who can also play 1B or OF in that slot as your primary guy isn't bad (maybe it's Rooker). And there's also no reason why you can't trade a guy, you just have to hope you trade the right one and get appropriate value for them. Against left-handed hitters, the Twins will look at analytics and place four players in right field. "...seemingly verging on an offensive breakthrough at age 26." I know spring training is the time of year when optimism runs wild.But the "seemingly verging" phrase could be used on maybe 20 Twins (across the Majors and the Minors). Might someone on this site expalin the differences betwee a left fielder and a right?I assume a part of it involves the arm and its ability to throw from right field to third base.And perhaps, given that roughly 70% of hitters are right handed so there are maybe more chances for a left fielder.I do appreciate Nick Nelson's articles that separate LF from RF. In even less ideal situations, such as a plodding no-arm guy, it might not really matter which corner you stick him in, and will depend on the strengths of your other corner candidate. I think RF gets about as many total chances as LF. There are no absolutes. Michael Cuddyer is deaf in his left ear, so he played RF, the better to hear his partner in center. We had the fairly recent experience of watching rag-armed Ben Revere do OK in RF for a time, because Josh Willingham was signed with RF in mind and then during Spring Training it was learned he wanted to stay in left, and the team went with the veteran's wishes. Life is what happens to you while you're busy making other plans. That's a good question. I don't really know why I put him there, since he's both a long-term sleeper and not an RF (as of yet). I think he might've spilled over from another section. I'll remove him. I don't think any other player on the Twins roster has the same level of statistical likelihood for an impending breakout. I’m not sure that jibes with reality. A right fielder running toward center field is going to have his left ear closer to the center fielder on plays over his head. His right ear would be closer only on plays in front of him - when he should be able to see the center fielder. Great question for Cuddy next time you're at a player panel. My only comment is I'm a fan and believer in Kepler. Always have been, though I was disappointed he didn't have his breakthrough in 2018...which I thought he might. Weird splits, ups and downs and lack of consistency aside, I see a tremendous athlete with power/power potential, a good eye, and a smooth and quick stroke that still tells me it's going to "click" for him. Very interesting he commented recently that perhaps he was being too patient waiting for a pitch, then not seeing another one he liked, and being more focused on just being aggressive this spring. I still believe everything is there to hit at least .270 and higher, while still making contact and having a quality OB with 20+HR power. Is 2019 his year? I sure hope so. Even Fred Astaire could slip and fall. It was just very, very unlikely. Same goes for Roger Federer, Lionel Messi, etc. They too can slip and fall. But the rest of us will slip and fall a lot more often. Imagine Daniel Day Lewis running through the forest in baseball cleats. Oh, the humanity! I would note that we also were subjected to R. Grossman in RF, yet another situation where the guy with the arm (Rosario) was left in place. And Willingham in LF because of 'veteran deference'? Sort of like Dozier leading off. Putting players in positions they prefer vs positions that help you win is one of the reasons you are no longer managing a MLB team. And rightfully so. One could actually argue that Buxton being out showed Kepler's and Rosario's true defensive value.When Buck is in, those two don't get as many chances and so their defensive metrics go down.But when Buck is out, those two get more chances, and they show what they are truly capable of.Just because the metrics go down when Buck is in doesn't mean Kepler/Rosario are actually worse fielders.I'd say it simply means they are getting less opportunity to show their true capabilities.